Bagyong JOLINA Update, Forecast, Storm Signals and Track (August 26, 2017) | #JolinaPH - Balita Boss! Philippine Atmospheric, Geophysical and Astronomical Services Administration (PAGASA) said on Thusday, August 24, that the low pressure area spotted over Catanduanes has developed into a tropical depression and was named Bagyong Jolina. Here's the weather update on Bagyong JOLINA from the state weather bureau. 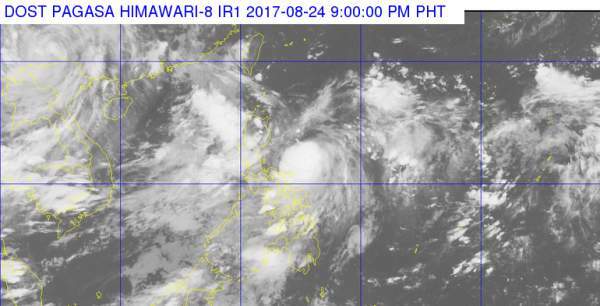 "TROPICAL STORM "JOLINA" HAS SLIGHTLY WEAKENED AND IS NOW IN THE VICINITY OF IFUGAO PROVINCE." According to the weather advisory of PAGASA, issued at 5:00 a.m., Bagyong Jolina, at 4:00 a.m., was estimated based on all available data In the vicinity of Aguinaldo, Ifugao (16.9 °N, 121.3 °E) with maximum sustained winds of 75 kph near the center and gustiness of up to 120 kph. It is forecast to move West Northwest at 20 kph. Isabela, Quirino, Kalinga, Mountain Province, Ifugao, Ilocos Norte, Ilocos Sur, Benguet, Abra, La Union and Nueva Vizcaya. Aurora, Cagayan including Babuyan group of islands, Apayao, Nueva Ecija and Pangasinan. For latest updates, kindly check below the Tweets about "#JolinaPH".